Proof Reading, Princess Turd & Dead Cats. I am so pumped for fall I just can't stop shopping for my fall wardrobe! Over the last month I've received a few packages from subscription services like Golden Tote (this review), Stitch Fix (this review) and Trendsend (this review), but I haven't been able to stop myself from shopping around other stores. I've found some great items and I can't wait to share them with you. Maybe you'll find something you can't live without either! I'm moving to Minnesota in two weeks! We leave Eugene on September 4th. I've been so busy getting ready to move that I've barely had the time to take any pictures, and coordinating with any of my photographers (aka family members) has been absolutely out of the question. So I'm settling for taking photos of my new loves on the floor. I'm grouping them into outfits so you can get a little taste of how I will style them. I'm also working on assembling my fall capsule wardrobe. It's so much harder than I thought! Especially since fall in Minnesota is going to require so many more layering pieces than in the summer. I'm having the most difficult time narrowing down my wardrobe to a reasonable number of pieces. I'm beginning to think I should stop calling it a capsule all together! Soon I will publish my capsule wardrobe on the blog, and I plan to share my outfits daily on my Instagram page. I'm in love with this Wildflower Boatneck Tee from Loft. As soon as I saw the pattern I knew I had to have it. I'm not even a fan of this kind of neckline, but I had to make an exception. 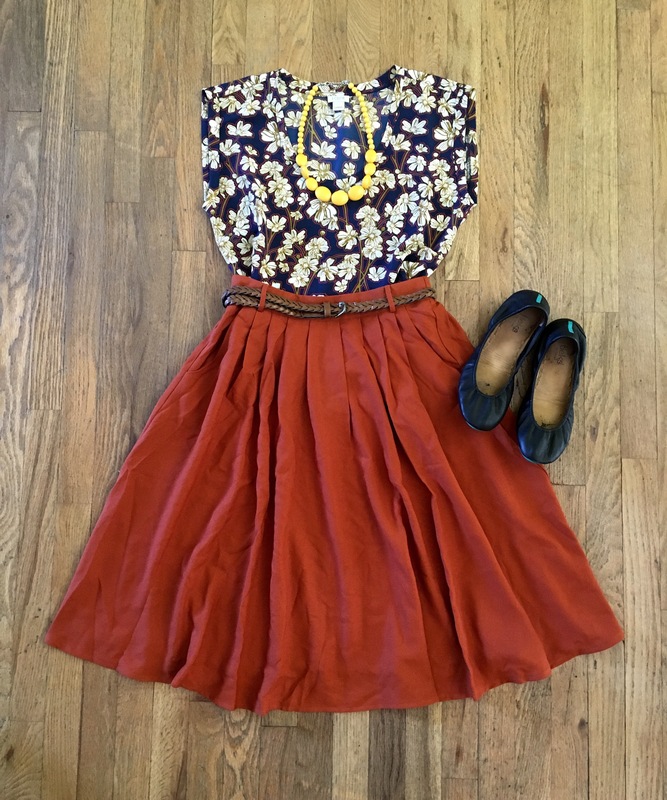 The colors of the small floral pattern work perfectly into my fall wardrobe. I paired it with the Charter School Cardigan in Honey that I purchased from Modcloth. I have been wanting a mustard colored cardigan for awhile now, but didn't find one I liked until now. 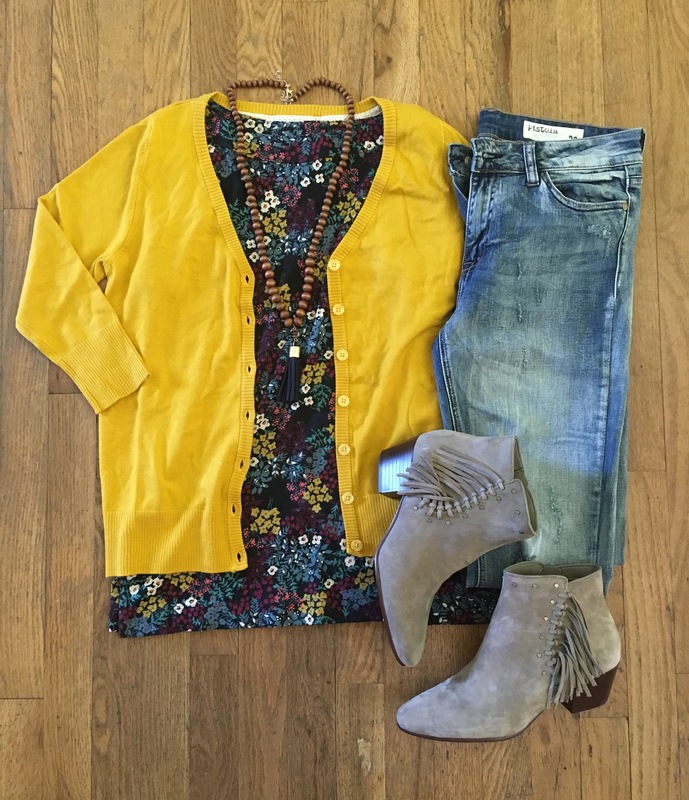 The color of the cardigan really makes the yellow flowers in the tee pop. Fair warning, to me this cardigan runs a little small. I finished off the outfit with my new Pistola jeans from Stitch Fix (review here), these fringe booties from the Nordstrom Anniversary Sale, and a necklace from Charming Charlie (similar). As soon as I saw the Springs to Mind Dress at Modcloth I knew it would be a great basic dress to have in my wardrobe. The color is a really pleasing mossy-gray, and the shape is very flattering. The skirt feels a little stiff, but I'm sure once it gets washed it will relax a little. 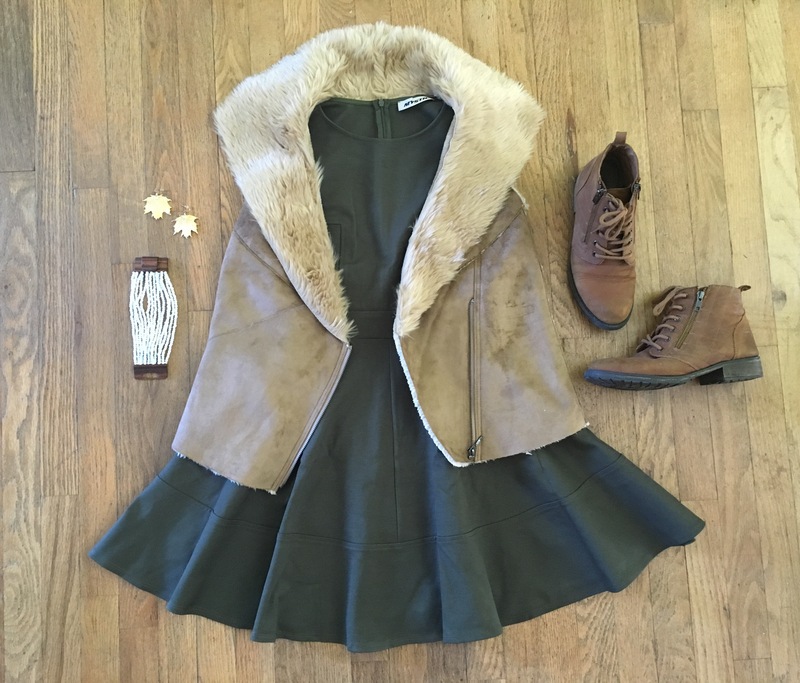 This dress could easily be dressed up for a date night, but for this outfit I wanted to do something different, by pairing it with a faux fur vest (similar) that I bought from Charming Charlie for only $10! For shoes I opted for my lace-up booties to make the dress feel even more casual, a chunky bracelet, and bright gold maple leaf earrings (similar) for a little bit of sparkle in an otherwise moody outfit. I love floral patterns, and even though I won't be working in an office I still couldn't resist this pretty Factory Printed Ruffle blouse from J. Crew Mercantile. Then when I saw this Breathtaking Tiger Lilies Skirt on Modcloth I knew it would be the perfect pairing. This skirt is everything. The color is a nice earthy orange that just screams fall, and it has pockets! I also appreciate that they sent a belt along with it. I sized down according to the instructions on their website, and it is a little snug, but I think will work just fine. This bright and baubly necklace, also from Modcloth, adds the perfect pop of mustard. I love my matte black Tieks. They are so comfortable, and they were great for teaching all day so I imagine they will also be perfect for chasing after my 2-year-old. As soon as I walked into Old Navy the bright mustard color of this sleeveless swing dress caught my eye, and I knew it would be perfect for fall. The fabric is pretty thin, but a pair of gray leggings and a dark wash denim jacket from Loft (last season, similar here only $30.99) help warm it up. I also added a skinny belt with tassel detail (similar in black and white) from Golden Tote to give the dress a little more shape. I love my tall riding boots by Steve Madden (similar and on sale!) and the turquoise earrings from Wantable (similar) add movement and color. I am in love with this Artist T-shirt from J. Crew Mercantile. The gold stripes are just so much fun, and add a little glam to this otherwise casual look. The other major player in this outfit is the Factory Printed Quilted Puffer Vest from J. Crew Mercantile. 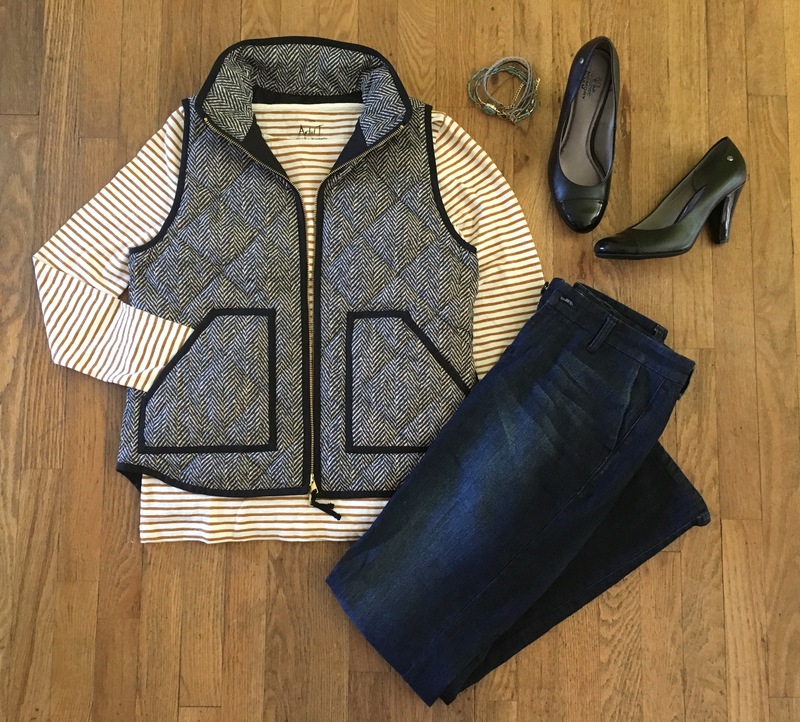 I have seen this vest all over Pinterest and have been coveting it for over a year. I saw it on a mannequin in the window and knew it had to be mine. The fabric isn't what I was expecting; it's not a tweedy material, rather the pattern is printed on polyester, but I think that just makes the vest more wearable and easier to clean (an important thing to consider for a mom with a toddler). The pockets have a convenient snap closure, and the vest looks nice with the collar popped or laying open. I chose a size small, and it fits perfectly. For bottoms I chose Dear John wide leg jeans (similar) that I received from Stitch Fix. For shoes I chose some simple black pumps, because these jeans require a little heel and I thought they would elevate the outfit. What I really need, though, are some great colored pumps, like these, or these... or these. Styling these outfits is really making me want to wear them. Too bad it's still upwards of 90 degrees for awhile. I never thought I would be excited for it to get cold. Do you like the outfits I put together? 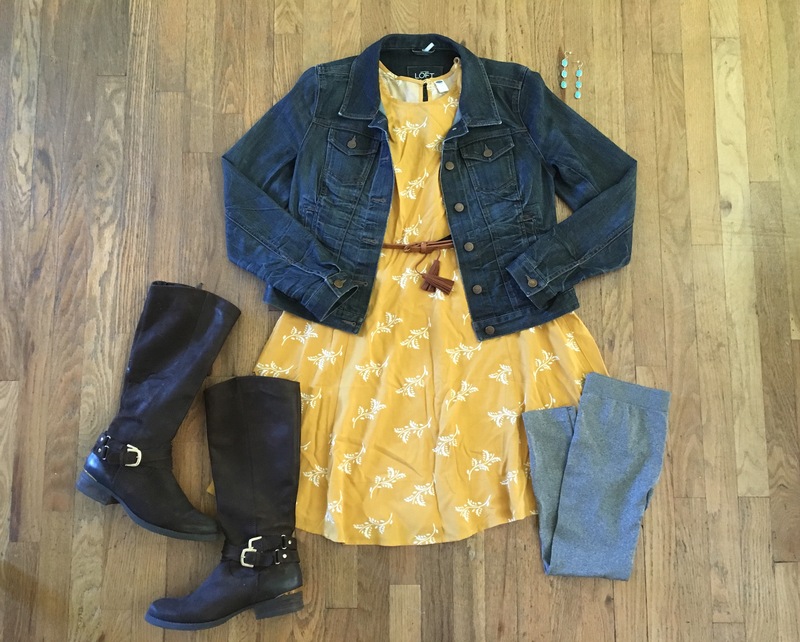 What's your favorite thing to wear in the fall? This post was originally published on my blog Skirts, Snails and Supermom Tales. This is not a sponsored post and all opinions and photos are my own. This post contains affiliate links. Clicking on links and purchasing products will grant me a small commission. All earnings help me continue running this blog. Thank you! Fall Fashion Items You Must Have!